Joenay is a new website that delivers news and information about the joys of adult coloring. It currently features art projects from the Be Happy Coloring Books line of products. “We are adult coloring enthusiasts ourselves, so having a blog where we can discuss the various brands, and address trends in this area was something we had to do,” says Tracee Garrett. 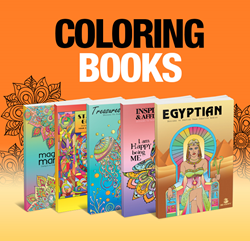 The popularity of adult coloring books has grown steadily the past few years. This relatively new phenomenon has been studied by behavioural psychologists for its positive effects on the human psyche. Coloring has the same effects on adults as children. Not only does it provide stress relief, but also allows for creativity to be explored by the person coloring. Joenay has added a blog to their website to discuss the topic of adult coloring and interact with other coloring enthusiasts. Be Happy Coloring Books was created by various artists from around the world. They are known for for their whimsical yet thought provoking designs, and has a fan-based following among adult coloring enthusiasts. The Be Happy Coloring book collection was designed to educate, inspire creativity, and also supply endless hours of stress relief. The books contain Hindu and Buddhist mandalas, inspirations and affirmations, loving couples, and amazing animals. The themes selected for the coloring books were designed specifically to enable individual to indulge in whimsy and creativity, and from users feedback they succeeded. Joenay.com is a website devoted to adult coloring and creativity. The website owners believe in offering readers, coloring enthusiasts, and would-be-artists the opportunity to indulge in a hobby that is good for their health and their spirit. The blog will allow for interaction and comments. The team at Joenay hopes that adult coloring fans will stop by and share their artwork within the community, as well as provide their thoughts, ideas and suggestions.